A global view of Mars created using images taken by NASA's Viking mission. New strategies are required to make sure hitchhiking Earth microbes don't contanimate Mars and other alien worlds, researchers say. Today's spacecraft feature sensitive gear that may not be able to withstand the treatment that sterilized previous Mars explorers such as NASA's Viking landers, said Penelope Boston, co-founder of the National Cave and Karst Research Institute in New Mexico. Boston called for new technology, including more planetary protection-compatible materials and electronics. "There's a lot in the engineering world that has not made the transition to the aerospace environment," she said. In 1976, NASA included an experiment on board its Viking landersthat hunted for signs of metabolic activity in the Martian soil. 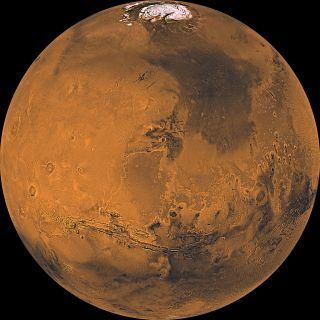 But the findings were ambiguous, and the debate has continued over the past four decades as to whether or not the experiment detected evidence of Mars life. One thing that people seem to agree on, however, is that the Viking experiment was not tainted by Earth organisms that the spacecraft might have introduced. "It has not been alleged to my knowledge that this is a problem with biological containment from Earth," John Rummel, of East Carolina University in Greenville, North Carolina, said at the conference. Rummel served for nearly a decade as NASA's planetary protection officer. "People were very confident that what they were doing was sampling Mars and not sampling Earth contamination." The Viking spacecraft underwent extensive testing, including extreme heating of its interior surfaces. "It was a smart design by people who weren't afraid of thermal testing," Rummel said. People are more afraid of thermal testing today, because today's instruments are more sensitive to heat. But the oil industry operates sensitive equipment at high temperatures, suggesting that heat can still be used to clean spacecraft effectively, Rummel said. Field exploration in extreme environments here on Earth could also provide inspiration, said Boston, who serves with Rummel on NASA's Planetary Protection Subcommittee. For example, Boston studies organismsthat live in caves and must take great pains to ensure that her samples aren't contaminated by material from the surface. And in some cases, keeping samples free of contamination isn't just good science; it's a matter of life and death for the humans involved as well. Underground pockets are sometimes filled with poisonous gas, Boston said, forcing scientists to wear suits that are completely sealed off from the environment. Some of the practices involved in organism containment here on Earth overlap with ideas for keeping samples from other worlds clean. But more needs to be done, Boston said. "We need to make that overlap much bigger," she said. "We have to learn to combine these, and we have to do that very soon." Reducing the risk of contamination as much as possible should be a big priority for the people planning NASA's sample-collecting Mars 2020 rover and other future missions, Boston and Rummel stressed. "It's expensive to implement planetary-protection measures," Rummel said. "But not as expensive as going to Mars and wading around in your old microbes."